Big Rigs brings you the best in local news. We pride ourselves on providing a quality news service which caters to its regional audience. We will soon be launching a new-look daily email newsletter! At multiple times during the day the latest news will be delivered directly to your inbox. We're local, like you, so the news and information you receive is totally relevant. 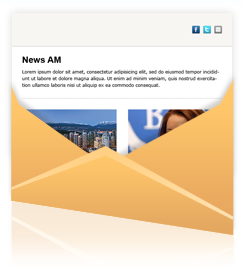 The newsletter will be presented in a new, fresh modern style. I'm in! How do I get it? Subscribe now and soon you will receive your daily newsletter. If you don't have a user account yet you will be asked to first register by clicking "register now". To manage your newsletters preferences make sure you have a user account, if you don't have one yet register now! *Your email address will not be used for any other purposes than sending newsletters.